The PAR-30MAAU remote controller can control up to 16 indoor units in commercial applications. 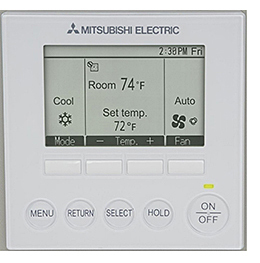 Offers a setback mode, a backlit LCD screen and a hold function that can pause a previously scheduled operation. Also features multilingual operation, weekly timer operation, auto-off timer, current zone temperature displays, a lockout feature, airflow direction and fan speed settings.